The mass shooting in Orlando, Florida early on Sunday is eliciting sympathy the world over for the dozens of victims and their families. It’s too early to know the attacker’s precise motives. 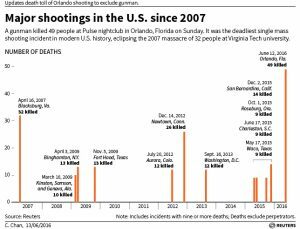 But as in similar tragedies, the death toll – the highest in a U.S. mass shooting – mounted as a result of the type of weapon involved. Washington’s failure to control access to increasingly lethal armaments is a blind spot that hurts America’s reputation. The event is already attracting rationalizations colored by politics. Donald Trump, the Republican nominee in November’s presidential election, took characteristically graceless credit via Twitter for “being right on radical Islamic terrorism” while his Democrat rival Hillary Clinton expressed sympathy for the LGBT community. Clinton also referred to the need to control access to certain kinds of guns. The semi-automatic AR-15 style model used to kill 49 people at Orlando’s gay Pulse nightclub was also used in the killing of 26 children and teachers at Sandy Hook Elementary School in 2012 and the murder of 14 people by a married couple inspired by Islamist militants in San Bernardino, California last December. Firearms killed over 13,000 Americans last year, according to the Gun Violence Archive, a figure which more than doubles when suicides are included. It has long befuddled America’s allies that a rich and civilized nation that regularly seeks to keep the peace around the globe seems incapable of reining in access even to military-style weaponry at home. Lobbyists at the National Rifle Association have somehow persuaded politicians that the right to bear arms embodied in the U.S. Constitution’s Second Amendment is sacrosanct in a way other elements of the Constitution are not. With Europe’s large bloc and China’s rapid growth to contend with, America’s economy is no longer so dominant. A widespread perception of inconclusive foreign policy has sapped the country’s influence, too. Rhetoric like Trump’s – he has invoked a temporary ban on all Muslim visitors and a wall along the border with Mexico – further undermines Uncle Sam’s power of persuasion. A ranking of countries’ soft power last year from Portland, a communications firm, put the United States third, behind the UK and Germany. The next edition is due out on Tuesday. America is still a haven of safety, freedom and prosperity, but over time it’s in danger of sliding down the list. 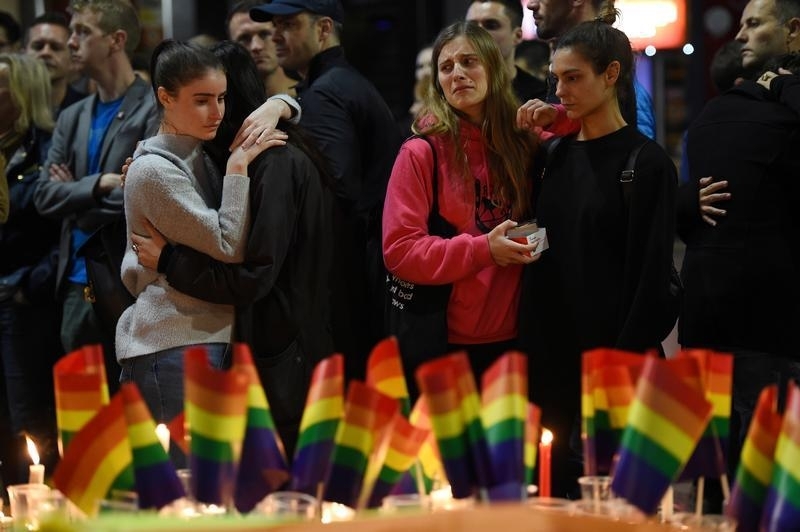 A man armed with an assault rifle and a handgun stormed a gay nightclub in Orlando, Florida, in the early hours of June 12 and killed 49 people in the worst U.S. mass shooting in history.